Recently, a clonal-functional relationship has been established in the mouse visual cortex (V1), such that clonally related neurons ("sister cells") shared similar orientation preference despite apparent "salt-and-pepper" organization of rodent V1 (Li et al Nature 2012; Ohtsuki et al Neuron 2012). Interestingly, the functional similarity between sister cells observed in Ohtsuki et al (2012) was weaker than Li et al (2012), suggesting that cell lineage might not the only determinant of response selectivity. Li et al (2012) found great similarity in animals that were imaged shortly after eye opening (postnatal days 12-17 [P12-17]), whereas Ohtsuki et al (2012) observed more diversity in preference in older animals (P49-62), indicating the possible impact of visual experience. However, several differences in methodology make it difficult in reconciling the results from these two studies. For example, the embryonic stage when the progenitors were labeled is different. In addition, the number of labeled cells per clone cluster is also different: The study by Li et al study, using in utero injection of GFP-expressing retrovirus at late stages of neurogenesis (E14-16), usually labeled a small number of neurons cluster per clone (<10 in most cases). The study by Ohtsuki et al, using a Cre-driver mouse line to label sister cells, can labeled ~600 cells derived from a common progenitor cell at the beginning of the neurogenesis (~E11). In order to explore the role of experience in specifying response properties of clonally related V1 neurons, we made in utero injection of GFP-expressing retrovirus at earlier embryonic stage (E11-12) and compared the functional similarity of orientation preference in sister cells between different age groups. Injection of retrovirus at earlier stage resulted in labeling a larger size of clones. Our goal is to use two-photon calcium imaging and in vivo circuit mapping method in order to understand the functional significance of circuits reorganization among sister cells in V1 and clarity the extent to which visual experience impact the patterns of connections and response properties that are specified by cell lineage. Dr. Li obtained his MD degree from Peking University Health Science Center in 2002 and his Ph.D. in Neurobiology with Drs. David Fitzpatrick and Leonard E. White from Duke University in 2008. His graduate work and a brief period of postdoctoral work at Duke focused on the role of experience in the development of orientation/direction selectivity in ferret visual cortex using in vivo intrinsic imaging and two-photon imaging. In 2010, Dr. Li joined Dr. Yang Dan's laboratory at Howard Hughes Medical Institute/University of California, Berkeley for his postdoctoral training. Using two-photon imaging combined with viral and molecular techniques, he demonstrated that cell lineage also plays an important role in specifying the neuronal circuits for orientation preference in the mouse visual cortex. More recently, Dr. Li has been developing techniques to perform chronic two-photon calcium imaging and electrophysiological recordings in awake behaving animals. 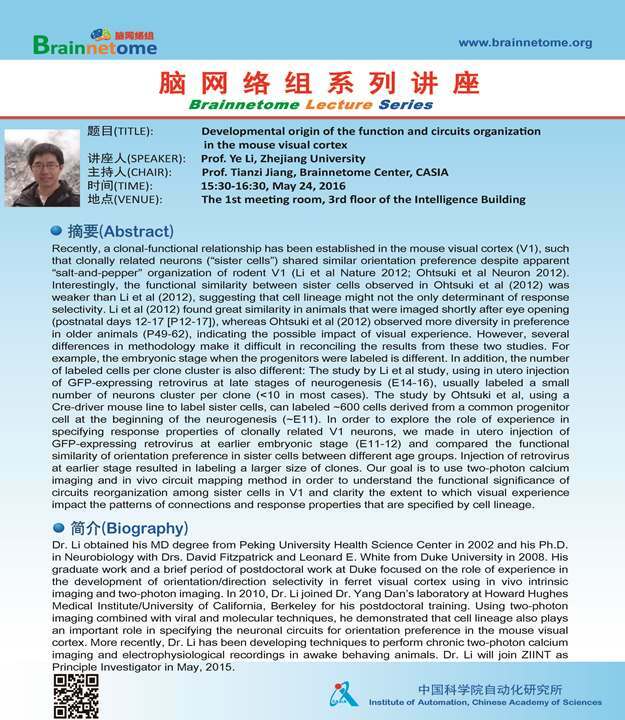 Dr. Li will join ZIINT as Principle Investigator in May, 2015.